To switch on the flash mode you quickly press the main power button twice. The flash is very slow, about 2 flashes per second, and is not nearly as attention-grabbing as many other lights' flashing modes. On the other hand, it is also much less distracting to oncoming traffic than lights with more strobe-like flashes. When in flashing mode the battery time is not shown; the screen displays a flash icon which turns on and off with the beam. I found this to be unnecessary and even distracting – it's obvious when the light is flashing, so if the screen isn't going to show any useful information, it should just turn off altogether to save battery. The BC30R uses two Cree LEDs behind custom optics to create a "dual pattern" beam. The light is cast wide and far, with flood optics filling in every detail near the light and the spot optics casting light far ahead. The optics appear to be identical to those of the BC30. On high output the optics make riding with this light feel almost like having a car's headlights. The downside is that on lower settings which might be adequate on a light with a narrow beam, the wide beam distributes the light so far that the beam is not very bright at any one point. Fortunately it has a high capacity battery, so it's practical to run the light for several hours even on the medium setting. The LEDs aren't meant to be driven at this output level for extended periods of time, so the boost can only be activated for 20 seconds at a time. The usefulness of this feature depends heavily on the type of riding you're doing. For mountain biking – which is what the light primarily seems to be marketed for – the boost mode is nearly useless. The times when you would most want to boost the light are when you can least afford to occupy one hand by holding down a button. It would be nice if pushing the button would boost the beam until either pushed again or until 20 seconds passed. For urban and road riding though, where it's easier to control the bike, the feature can be quite handy. Much as you might flash the high beams in a car to signal another driver, the boost mode can be used to quickly grab the attention of other people nearby you – for example, flashing a driver who you think is about to turn across your path. It can also be handy if you see possible debris in your path and want a bit more light for a moment. A more useful design for the remote switch might have been a single press to switch between modes (like the regular button on the light), and a press-and-hold to activate the boost. The remote switch on the BC30R seems to be less responsive than the BC30's switch, perhaps because the signal is being processed digitally, or perhaps because of a difference in construction. It often took about a second for the switch to register with the light. While this sounds like a short time, consider that flying down a hill at 30 mph you would travel about 30 feet in one second, so the hazard you were trying to illuminate may already have passed by the time the output increased. Overall I did not find the remote switch to be a very useful feature of the light. In addition to the challenges with the remote switch, I found the main buttons to be difficult to use when wearing gloves or with cold fingers. It takes a firm press on the right part of each button to actually activate it. Fenix lights use digital voltage and temperature regulation to maintain a constant output throughout the runtime of the light. If the light gets too hot, the output will be temporarily decreased until temperatures come down. When the battery voltage gets too low to run the highest output level, the output is decreased to the next highest level to ensure continued operation of the light. In our standard battery runtime test, the light lasted 1:50 hours on high before stepping down to level 3, and lasted a total of 2:40 hours until turning off completely. A micro USB cable is included for charging. It takes overnight to recharge the light from empty, and using a fast charger such as a USB 3.0 port or a high-amperage phone charger will speed up that process. The battery is not user-accessible, so you may want to consider the BC30 if you need the ability to swap batteries mid-ride. While charging the OLED screen displays a battery icon with 4 bars that fill up as the battery charges, allowing you to keep an eye on charging progress. The BC30R uses a large, bulky, heavy mount which cannot be quickly installed or removed. If you frequently switch your light between bikes this may be a hassle for you; however, if you're often riding on rough terrain you'll appreciate that the mount doesn't budge. 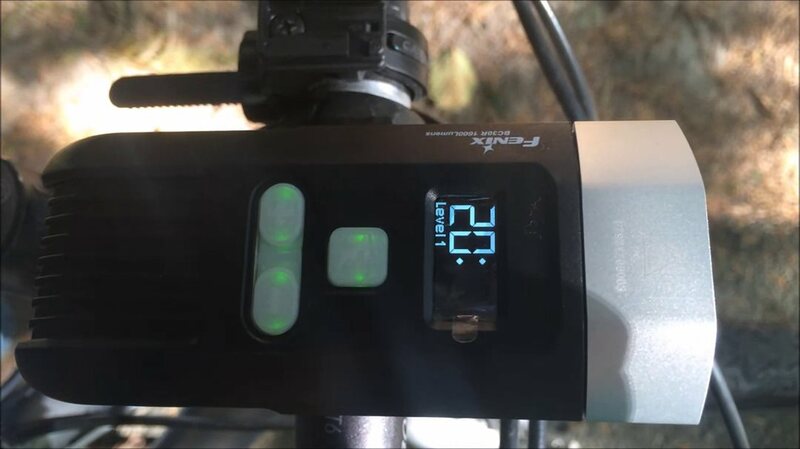 For those riders who are particularly weight-conscious, this may not be the best light for you... the whole package weighs 221 g without the mount, and the mount itself weighs more than some lights do. The BC30R is of course very similar to the BC30, with the big differences being the OLED display and the integrated USB rechargeable battery. Fenix also sells a number of other bike lights with varying degrees of similarity. The BT-R series looks very similar, but has an external rechargeable battery pack. This offers a compromise between the flexibility of being able to swap out the battery at any time and the convenience of having a rechargeable pack which doesn't require a special charger or buying batteries separately. A few other manufacturers offer lights with OLED screens. The MagicShine Eagle 600 was the first, although the light seemed overpriced and underpowered at the time, and a new version has not yet been announced. The closest competition is probably the NiteRider Lumina 800 OLED. It shares the same max steady output as the BC30R's 800 lumens, although it does not have a boost mode or remote switch. The battery life is also no contest – the BC30R's larger battery gives it an hour more runtime than the Lumina. I have not done a full review of the Lumina 800 OLED, but tried one out in a local store and found the interface to be much more confusing than the BC30R's. A live battery runtime screen is neat, but ultimately I think there are cheaper ways to convey this type of information. The Light & Motion Urban series lights use a tri-color LED to convey battery status. As the battery runs down, the indicator changes from green to yellow to red and finally to flashing red. The indicator is a small, simple addition and yet conveys nearly the same information as the full screen on the BC30R. If you're in the market for a high-powered light with good optics, great runtime, and an innovative and intuitive interface, the BC30R is definitely a strong contender. On the other hand, if you're more of a no-frills rider and can do without the fancy display, the BC30 gets you much more flexibility, a higher max output, and is quite a bit cheaper. 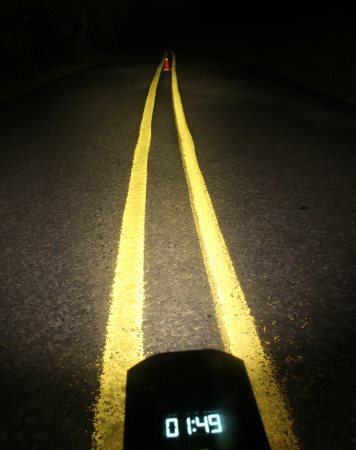 If either of these lights seems like it might be overkill for you, there are many more options to choose from – check out the full headlight recommendations page for our top picks. 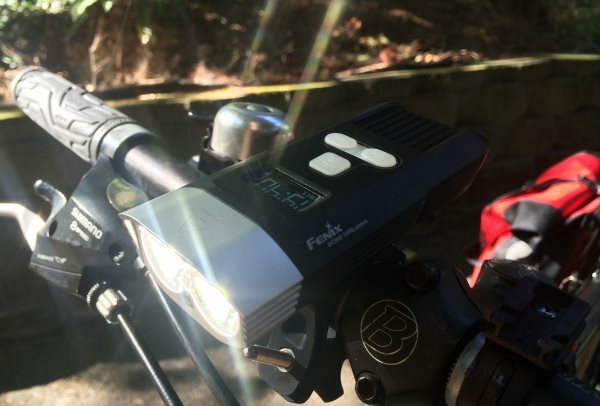 The BC30R tested for this review was generously provided by BestLight.io, an online dealer of Fenix and other top-notch bike light and flashlight brands. 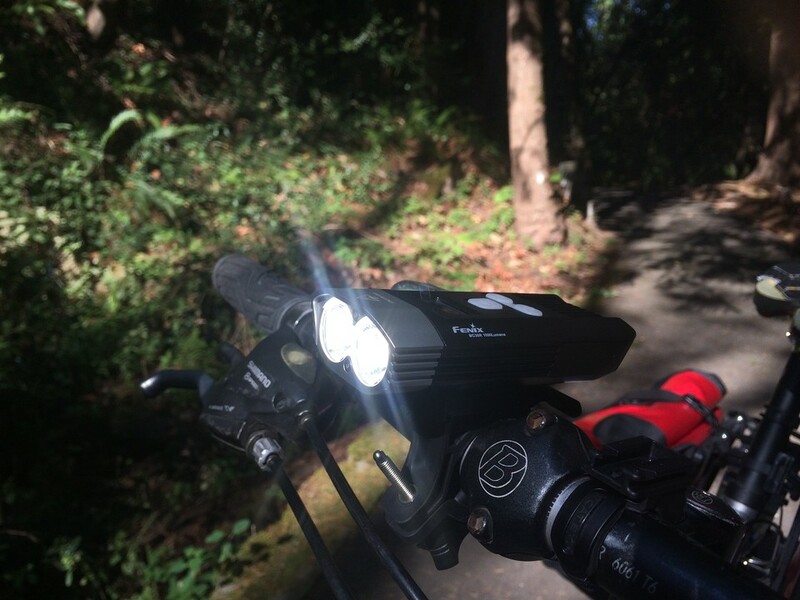 All products on their site are 10% off for Bike Light Database readers with the coupon code BLDBFAN. That means you can get the BC30R for $126, cheaper than it's available directly from Fenix, on Amazon, or elsewhere online.